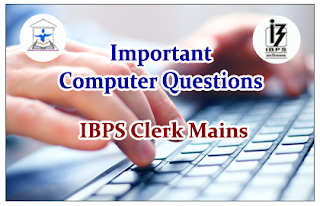 Dear Readers, Important Computer Questions for Upcoming IBPS Clerk V Mains Exam was given here with answers. Aspirants those who are preparing for the examination can use this. 1). Which of the following statements is/are true? 2). MOS stands for _______. 3). Size of the Primary memory of a PC ranges between _________. 4). Read only memory is permanently ________ in computer. 5).Which of the following companies is a leader in manufacturing of Hard Disk Drives? 6).A Browser is a ________. 7).The first UNIX operating system was written in the _________. 9).Which one of the following is not an Internal DOS command? 10).The server on the Internet is also known as a _________.